"We don’t need a generation that would jump into leadership later in life because they have got money. No! We need a generation that, even if given guns, would still know what to shoot and what not to shoot, when to shoot and how to shoot." My take on this topic is just but a voice of a political bambino as aforementioned but all the same, thoughts must be aired out. I will not tackle this topic as an expert in history, politics, sociology or anthropology but I am rather going to brainstorm with South Sudanese who are my target audience for them to look through my subjective solutions to tribalism in our country and maybe develop such ideas to solve and stabilize our boiling and burning nation: South Sudan. We have seen in the few decades that countries with high tribal and diverse populations generally enjoy bad governance and lower economic development. This cancerous identity called ethnicity in modern terms and tribalism at its primitive level, has engulfed and constricted the nationalism and globalization of our country since its birth seven years ago on 9th July 2011. This has led to a series of unhealthy tribal conflicts that have in one way or the other led to genocides and massacres heartbreakingly referred to as ethnic cleansing. This has created a deep-rooted hatred between/among the affected tribes. If ethnicity is not considered to be a threat to the future governance in South Sudan and possible remedies provided, then we shall be heading to a country that might, unfortunately, go into a series of election violent acts in the near future before a final normalcy is achieved. This ethnic cancer has also eaten up the development of our nation as we can see in the government offices and NGOs [Non-governmental Organizations]. We can see that any politician will surround himself with people of his own ethnic group or clan for security purposes. On the other hand, a less competent person will be given a job based on his ethnic group even though he got no qualifications for the job in question. This has encroached to the clan levels in NGOs whereby a certain clan will have a higher percentage compared to other clans in that region, a situation referred to as nepotism, but as lethal as tribalism itself. Tribalism and nepotism have created deep hatred among South Sudanese and hence, some people tend to envy other people’s properties making disputes and conflicts eminent. The cohesion among the communities has become loose and this has unexpectedly sent a Rest In Peace (RIP) message to nationalism. It will be an insult to mention globalization in a country where nationalism is limping and groaning, and so we would call globalization a utopia for now in South Sudan. As a concerned citizen and a man that has been inspired by the words of U.S former president J.F. Kennedy-- Ask not what your country can do for you but ask what you can do for your country, I have the following solutions to curb tribalism and make South Sudan a better country where all its tribes/ethnicities can live in peace among each other as nationals and global citizens. We are in a country where the larger percentage of the population has got a tribal mindset of ‘he is our man,’ while few of the elites who know the better way to treat tribalism as a development tool are voiceless, not in that they don’t talk, but it is because their ideas are ignored by the tribal majority. For this minority to change the mindset of the majority, a period of time is needed for a revolution to happen. Any revolution begins with reforms and for the sake of reforms, I brought up the idea of a Tribal Cngress. A Congress that will be composed of representatives from all the tribes in South Sudan. These people must be well educated and fully aware of the disadvantages and advantages of ethnicity for them to hold the tribal trust of the majority and work on how to curb tribalism in the time frame they can see to suit that big national project of tribal healing and nationalism. The other positions in the government can be contested for tribe-less but this tribal congress will be elected by their respective tribes. Their term of service would be discussed to suit the people they represent. Our federal system of government will still hold but I still urge the government to claim or reclaim land ownership. I need a mixture of both communism and capitalism in our economy in a way they would suit our communal societies in a better way. The government should do the survey and use its money to build houses. These residential houses would be rented by the inhabitants regardless of your tribes but with subsidized prices. Any person with capital must consult the government, give out his design and the government would do the survey and build for him whatever he asked for in the price that suits the agreement but on a lease basis. This will curb land disputes and people will leave their typically communal settlements with time, thus leading to nationalism as a new form of identity. If the communal land ownership is abolished and people become free to settle in cities of their own choices in South Sudan, then the only identity to be used is the name ‘South Sudanese’ and the city you live in. This will erase tribalism from the minds of the upcoming generation and somewhere in between, as natural as we know, a ‘generational exit’ will automatically happen. When that happens, I mean when we, who would still might be having a drop of tribalism in us, are finally extinct, then the new generation will tell our tales in their literature. It would be history although a dark history but in a free and prosperous South Sudan. Starting from the upper primary classes up to the college levels, the school curriculum must come up with some compulsory courses or subjects that would give youth and children early insights on the structure of their nation and the world at large. These subjects include politics, leadership, constitution and culture. The subject of politics will open up their eyes to the available political parties and how politics has been in the past and currently and also give insights to international politics and what to use in our country wherever applicable. By the time a student is at college, he/she should have known which political party to join or not, and there could be a birth of new ideas that would help steer this nation ahead. Everyone is a leader and hence good governance is the code of an acceptable and mature leader. We don’t need a generation that would jump into leadership later in life because they have got money. No! We need a generation, even if given guns, they would still know what to shoot and what not to shoot, when to shoot and how to shoot. The constitution must be taught to everyone and even if it means translating it into our ethnic languages for the case of the tribal majority, then so be it. We need a society that is law abiding. We need a society that does not and cannot pervert the rule of law because of their identities and securities. The subject of culture will tackle our cultural diversity and how to use it for the betterment of our nation and as a globalization tool in areas such as tourism and literature. In conclusion, I would say that this literate South Sudanese society can be born just in twenty to thirty years. How sweet would that be? 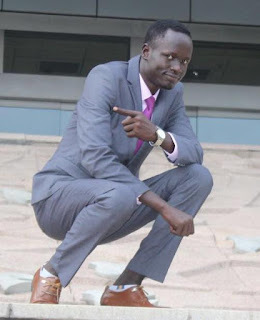 I would like to see a nation where Deng, Lado and Gatluak would make comedy on their dark past and laugh it off while sipping tea at the streets of cities such as Yambio, Juba and possibly Ramciel. I need a country where my seven-year-old daughter can travel from Rumbek to Gumruk alone by train and come back in one piece. I need a country whereby I can make noise and speak my mind freely as long as I am not troubling any citizen and in case I get mad, the cops can still handle me with love and care until the law takes its cause on me. That is my dream and I can feel that it will come to pass, and even though it would not be in my lifetime, I don’t mind. Editor's Note: The ideas expressed in this article don't necessarily reflect the position of 'The Philosophical Refugee' but of the author.